I met yesterday with a colleague and got chatting about the need for collateral to succeed. I couldn't remember ever seeing Google collateral and neither could he. 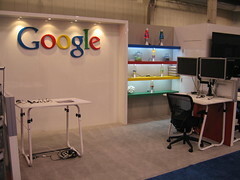 Today while searching for something else I happened across this photo of a Google booth at a hosting event last year. I don't see any collateral, do you? There are Lava Lamps though. Just the right amount.